Despite all the glitz and glam, California is the fourth most stressed-out state in the U.S. This was one of the findings in a study conducted by Movato, which also identified Florida, Georgia, and New Jersey as other stressful states. 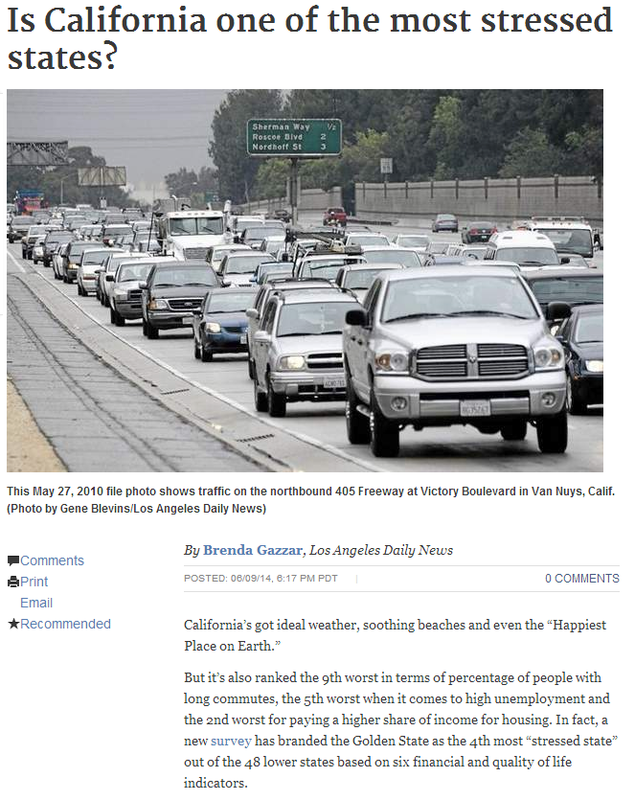 “Californians worked an average of nearly 38 hours a week (rank: 38th), had a population density of 240 people per square mile (rank: 11th) and nearly 22 percent of its population has no health insurance (rank: 7th), according to the survey. It’s not a surprise, then, to see health and wellness spas like The Healing Station offering both quality skin care and a relaxing massage in Folsom. After all, taking a few hours off to relax and rejuvenate is perhaps the best thing someone can do to cope with stress. Experts suggest there are a several ways to alleviate stress. Some methods available to everyone are exercise, eating healthy and making a conscious effort to keep a positive attitude. If possible living near work removes the daily stress of a long commute. This could require moving or changing jobs. Unfortunately, these last solutions may not be feasible for many people. There is also the fact that stressors are literally found anywhere. For instance, pollution, crowds, and noise are inevitable for those living in urban areas. Yet the alternative, which is to do nothing, is an even worse idea. Chronic stress has been linked to anxiety, fatigue, high blood pressure, and a host of other health problems. Even acute or short-term stress can cause headaches and muscle tension. If left unchecked, stress eventually leads to conditions like diabetes, obesity, and heart disease. How does a Folsom massage center fit in with all of this? Among other things, a massage can help ease tension, reduce pain, and improve body circulation, thereby counteracting the adverse effects of stress. The peaceful environment in a massage center can also relax both body and mind, which is a welcome change from the hustle and bustle Californians have to live with every day. To take advantage of the relaxation options available at the Healing Station call today at 916-294-9980 or click on the “Schedule Online” link at the top of our website.